Mac and I had just spent a little less then a week in Basel, Switzerland for Art basel 2010 doing a little live painting with LA Art Machine. At this point we were on our grind to Berlin where I had a live painting project curated by the illustrious Jaybo Monk for the Project Room. During the travel up by train Mac and I were both doing our usual, sketching during travel. To my delight I became one of his subjects, hence the illustration above. 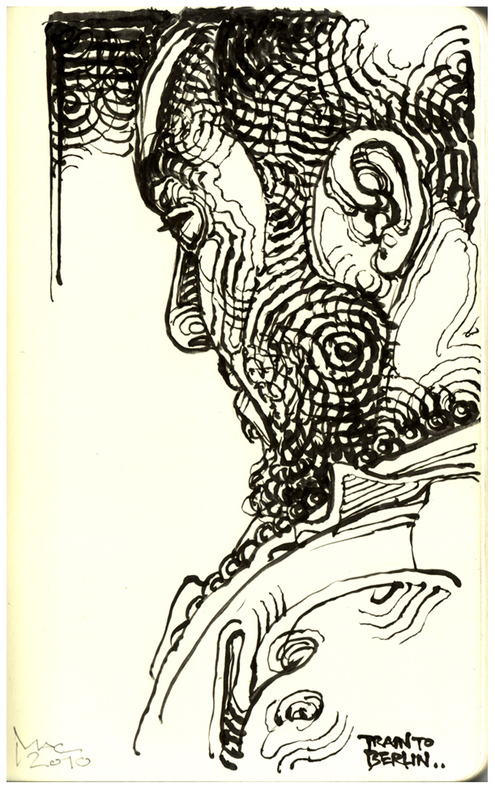 Not many have seen his raw sketchbook illustrations of figures, many of which include sleeping travelers. I’m blessed to be familiar with such creative peoples.